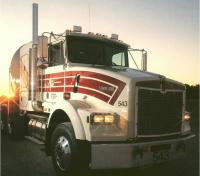 Ag Trucking is a leader in the bulk transportation industry. Since our formation in 1978, Ag has served many of America's largest companies, hauling a wide variety of bulk commodities. Our food grade liquid division is well known throughout the industry as being exceptionally safe and reliable. Ag's industrial dry bulk division has an equally stellar reputation of handling bulk commodities with both dump and pneumatic service. From our corporate office in Goshen, Indiana we operate six terminals in the Midwest and Southeast. As a company, we are committed to deliver the best in transportation service products. Sharing strengths and working together as a team creates an important long term advantage. Both internal and external customer loyalty, trust and respect can only be earned through our performance reputation. With each load we haul, telephone we answer, freight bill we mail, truck we service and tank we wash, our reputation is on the line. We have no more important mission than to protect and polish this reputation as a team. Ag Trucking can assist you with a variety of solutions to your transportation challenges. For over 30 years we have helped our customers achieve their goals by offering exceptional transportation services, on-time and hassle free.